This was in the hospital. What does it mean? When I went to St. Joseph Mercy Hospital in Ann Arbor Michigan the other day for a visit, I stopped by to pray at the Blessed Sacrament in the chapel. 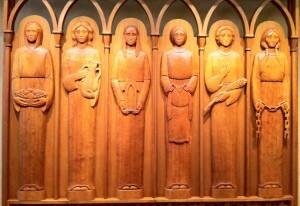 In front of the chapel was this wood carving. I also, like all of you, sat in front of it puzzled. Who are the women; what’s in their hands? What does it mean? Then it came to me. A Catholic hospital, especially one with the word “mercy” in its name, practices the Corporal Acts of Mercy. The six items held by the women representing the virtues or acts of mercy are taken straight from the Gospels – from Matthew 25:34-36 and are the basis for judging whether people are going to heaven or hell. Humbling words! I think the 5th image represents flowers that are often brought to the sick in hospitals. I think it’s the Corporeal Works of Mercy minus ‘To Bury the Dead’. Also, I’m not sure why ‘To Visit the Sick’ is a plant branch. Is it the 6 corporal works of mercy? I don’t know about the fifth one. Which hospital is this carving located? 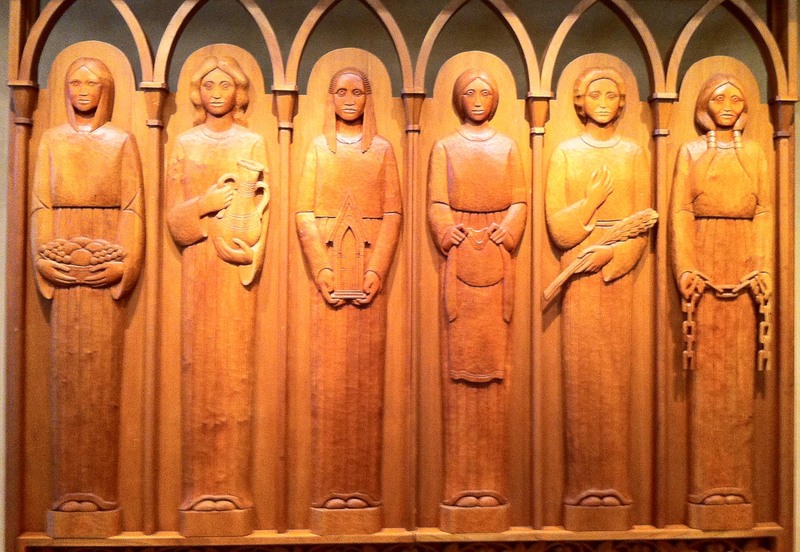 Perhaps the woman, who is wearing a different hair style in each depiction, represents “Mercy” herself. And the fifth object is perhaps a “medicinal herb”. They do seem to be straight out of Matt 25:34-36. Food, drink, home, clothes, visiting the sick with medicine and visiting those who are imprisoned or shackled. I am a Woodcarver myself and when I see beautiful work done by other carvers it is just great! Beautiful work. A very diverse group of women, too! From what I see is that the Church is telling us that we should do the act of Mercy not only to the people that look like us and dress like us but also to those that don’t look like us and dress like us, hence the carving depicts different eyes and the different hair styles, representing people from all-around the Globe. Acts: 28-28. The fifth Image shows that the figure is caring a herb in her hand to treat sickness and a hand on her heart, showing compassion for someone who is suffering. all the others don’t have their hands on their heart. Previous post: Is Faith Alone the Basis for the Final Judgment?